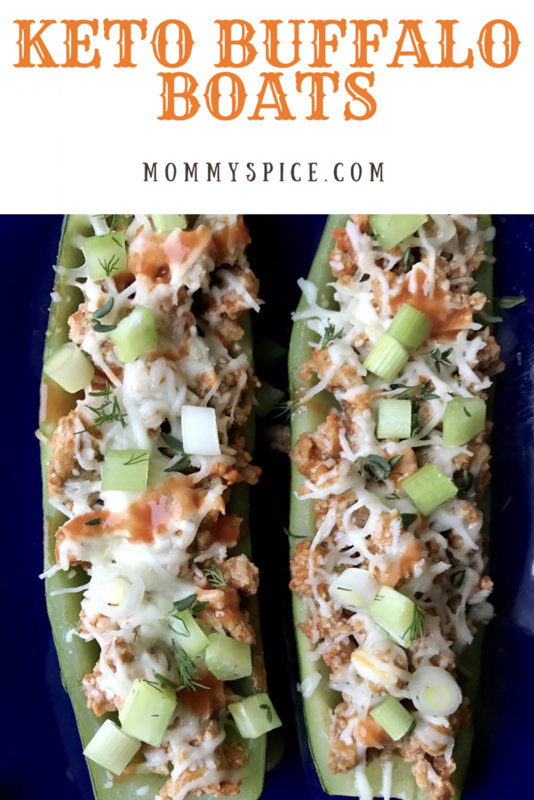 As a lover of all things buffalo chicken this recipe was a fun one to make. 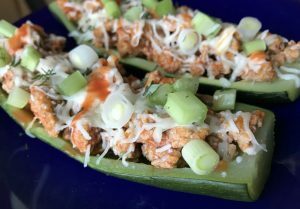 My first Keto recipe invention and now my husbands most requested. His favorite part is the one he was actually most skeptical to, the celery thyme relish. 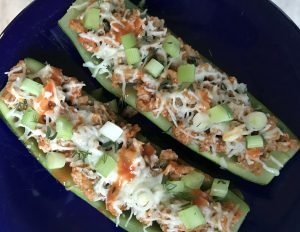 The zucchini boats are such a great vessel for just about anything, however once cooked they lose a lot of texture, enter my crunchy relish concoction. I personally love my buffalo chicken with ranch and I started to play with the idea of using the flavors in ranch. Fresh dill, thyme and scallions married together perfectly but I wanted more texture. What are buffalo wings always served with? Celery! A relish was born, and this dish was taken to the next level. First up preheat your oven to 350 degrees. Wash your zucchinis and cut them lengthwise. Next hollow out your halved zucchinis, I like to leave mine a little thicker on the ends to keep all the filling in better. 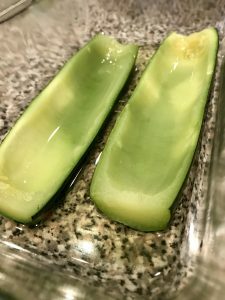 In a glass baking dish pour half a cup of water and then place in your zucchini boats not touching and cover with foil. The water and foil are going to create a nice little steam bath for the zucchini’s. Bake them in the oven 15-20 minutes, or until fork tender. While your boats cook, brown your turkey meat in a medium size frying pan over medium/medium high heat. Once cooked through stir in the buffalo sauce. Carefully take your zucchini boats out of the glass baking dish draining any water that may have stuck to them. Place on a foil lined baking sheet, fill your boats with buffalo turkey mixture and cover with mozzarella cheese. Put them back into the oven for 5 minutes to melt the cheese. While they finish cooking dice up celery, scallions, and fresh herbs. When the mozzarella is melted, take your zucchini boats out of the oven and onto your plate. Top with the celery thyme relish and enjoy! 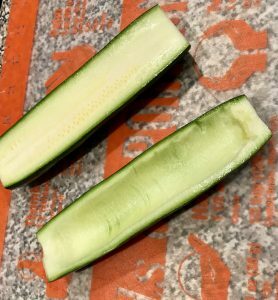 Here’s a side by side of your zucchini, one half scooped out the other not. Just to give you an idea of what you’re looking for if this is your first time making zucchini boats. This is what they should look like after being steamed in the oven. 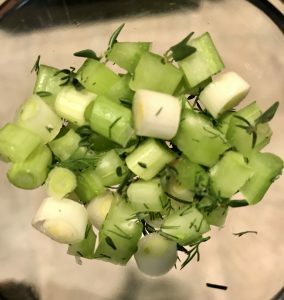 An example of the celery and thyme relish. I know that looked like a lot of work, however, once you get the hang of steaming the zucchini boats it’ll come together pretty quickly. If you’re only looking to steam one zucchini instead of 2, the method will be about the same you just probably won’t need as much water to steam them. My tip for this one is if you don’t have buffalo wing sauce, hot sauce will work just fine. Play around with the amount you add and as always, taste as you go! If you prefer a sweeter wing sauce, such as a teriyaki, just be sure to look at the carbs and sugar to keep this dish Keto.